- XPW Reseda Show (September 24, '99) = Kid Kaos fell to Michael Modest. - XPW Ventura Show (September 25, '99) = Kid Kaos pinned the Shooting Star. - XPW Reseda Show (October 29, 99) = Kid Kaos defeated Cybil. - XPW Ventura Show (November 20, '99) = Kid Kaos lost to the XPW Champ, Damian Steele. - XPW Reseda Show (November 27, '99) = Kid Kaos won a "Three-Way" Match over Michael Modest and Phenomenal Phil. - XPW Hollywood Show (December 18, '99) = Kid Kaos was beaten by Jake Lawless. - XPW Reseda Show (December 21, '99) = Kid Kaos fell to Supreme. - XPW Hollywood Show (January 29, '00) = Kid Kaos defeated Jimmy the Homeless Guy. - XPW Ventura Show (February 25, '00) = Kid Kaos took down Dynamite D.
- XPW King of the Deathmatch Tournament (February 26, '00) = Kid Kaos lost to Supreme. - XPW Bakersfield Show (March 24, '00) = Kid Kaos won over Carlito Montana. - XPW Hollywood Show (March 25, '00) = Kid Kaos was pinned by Carlito Montana. - XPW Ventura Show (April 28, '00) = Kid Kaos & Steve Rizzono were beaten by the West Side NGZ. - XPW Los Angeles Show (April 29, '00) = Kid Kaos & Steve Rizzono lost a "Three Way" Match to Public Enemy. The West Side NGZ were the other participants. - XPW "D-Day" (May 26, '00) = Kid Kaos fell to Steve Rizzono. - XPW Bakersfield Show (May 27, '00) = Kid Kaos took down Steve Rizzono. - XPW Ventura Show (May 28, '00) = Kid Kaos & Johnny Webb were beaten by Steve Rizzono & Kronus. - XPW "Vengeance" (June 17, '00) = Kid Kaos once again fell to Steve Rizzono. - XPW "Go Funk Yourself" (July 22, '00) = Kid Kaos lost a "Submission" Match to Steve Rizzono. Later that night, Kid Kaos won a "Loser Leaves XPW" Match over Tracey Smothers. - XPW "Dismembered In November" (November 11, '00) = Kid Kaos defeated Juventud Guerrera. - XPW "New Years Resolution '01" (January 17, '01) = Kid Kaos fought to a No-Contest with Juventud Guerrera. - XPW "The Night XPW Stood Still" (March 17, '01) = Kid Kaos lost a "Three Way" Match to the XPW Champ, Sabu. 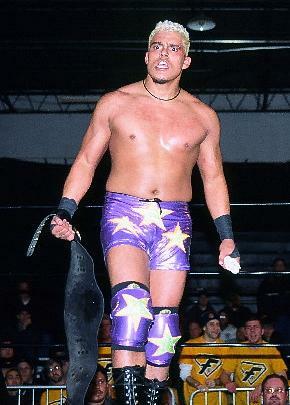 Juventud Guerrera was the other participant. - XPW "Scene Of The Crime" (April 21, '01) = Kid Kaos took down Steve Rizzono. - XPW "Redemption" (May 26, '01) = Kaos became the #1 Contender to the King of the Death Match Title by beating Johnny Webb. - XPW "Rapture" (July 7, '01) = Kaos won a "Death" Match over the Supreme. - XPW "Damage Incorporated" (August 25, '01) = Kid Kaos beat Steve Rizzono, Dynamite D and Konnan to win the XPW Television Title Tournament. - XPW "Halloween In Hell 2" (October 13, '01) = Kaos retained the XPW TV Title, winning over New Jack. - XPW "Retribution" (November 24, '01) = Kaos stayed the TV Champ, defeating Pogo The Clown. - XPW "New Years Resolution '02" (January 12, '02) = Kaos kept the TV strap, winning a "Triple Threat" Match over Psicosis and Nosawa. - XPW "Freefall" (February 23, '02) = Kaos retained the XPW Television Title, winning a "Gauntlet" Match over Angel, Chris Hamrick and Nosawa. - XPW "Genocide" (April 27, '02) = The Enterprise (Kaos, Steve Rizzono, GQ Money, Veronica Caine & the Sandman) won a "Steel Cage" Match over the Black Army (Johnny Webb, Angel, Nosawa & Lizzie Borden). - XPW "Liberty Or Death" (June 29, '02) = Kaos stayed the TV Champ, beating Chris Hamrick. - XPW "The Night of Champions" (July 20, '02) = Kaos won a "Triple Threat Ladder" Match over Chris Hamrick and Psicosis to keep the Television Title. - XPW "Hostile Takeover" (August 31, '02) = Kaos retained the Telvision Title, winning a "Ladder" Match over Chris Hamrick. - XPW "Fallout" (October 5, '02) = Kaos lost a "Non-Title" Match to Danny Doring. - XPW "Exit Sandman" (November 16, '02) = Kaos defended the TV Title, beating Danny Doring. - XPW "Merry F'n Xmas" (December 21, '02) = Kaos lost, via DQ, to Danny Doring. Kaos stayed the TV Champ. - XPW "New Years Resolution: Aftermath" (January 18, '03) = Kaos kept the Television belt, winning over Jonny Storm. - XPW My Bloody Valentine '03 (February 14) = Kaos stayed the XPW Television Champion, beating Shark Boy. - CZW Breaking Point: Let The Chaos Begin (October 9, '04) = Kaos lost to the CZW Heavyweight Champion, the Messiah. - CZW Night of Infamy III (November 14, '04) = Kaos fought to a No-Contest with Adam Flash. - CZW Cage of Death VI (December 11, '04) = Kaos lost a "Ladders & Scaffolds Three Way" Match to the CZW Heavyweight Champ, the Messiah. Adam Flash was the other participant. - CZW GenZ: The Transfusion (January 8, '05) = Kaos lost to the CZW Iron Man Champion, B-Boy. - CZW Only The Strong: Scarred For Life (February 5, '05) = Kaos lost a "Falls Count Anywhere" Match to Adam Flash.